He Jiankui had told a packed biomedical conference Wednesday he was "proud" to have successfully altered the DNA of twin girls born to an HIV-positive father, an apparent medical breakthrough. Bai Hua, the group's head, said he had introduced 50 families to He's team. "In the beginning we did not understand what it was they were really doing. Actually right now my personal feeling is that they are a bit crazy," he told RTHK. "The team all along emphasised that the chance of success was high, and that there were risks, but they were low," he told RTHK. 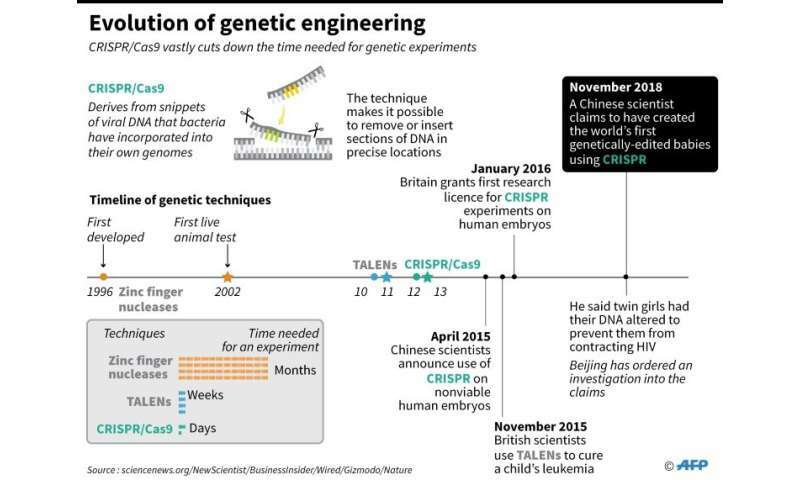 Graphic on the origins of the CRISPR/Cas9 genome editing technique. David Baltimore, a Nobel laureate and chairman of the organising committee, told reporters it was He's decision not to attend. 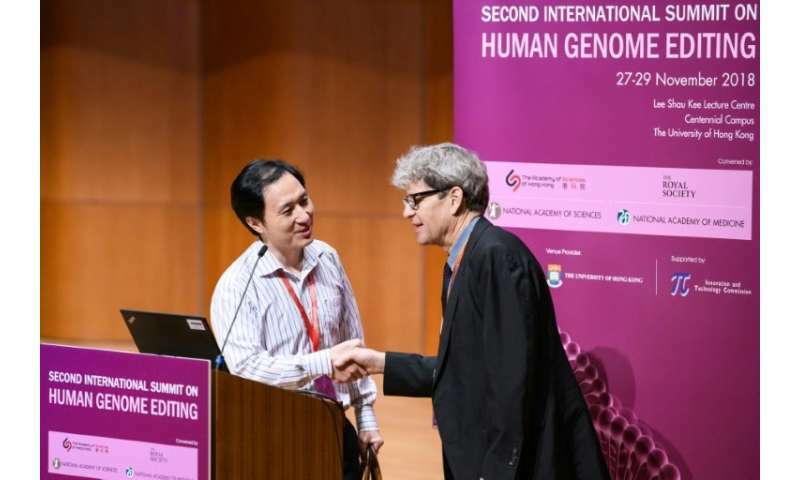 Organisers of the Second International Summit on Human Genome Editing denounced He's "unexpected and deeply disturbing" claim that human embryos had been edited and implanted, and called for closer supervision of the field at the conclusion of the conference Thursday. "Even if the modifications are verified, the procedure was irresponsible and failed to conform with international norms," they said in a statement. "Its flaws include an inadequate medical indication, a poorly designed study protocol, a failure to meet ethical standards for protecting the welfare of research subjects, and a lack of transparency in the development, review and conduct of clinical procedures," it added. University professor He, based in the southern Chinese city of Shenzhen, said the twin girls, born a few weeks ago, had their DNA altered to prevent them from contracting HIV. Eight volunteer couples—HIV-positive fathers and HIV-negative mothers—signed up to the trial, with one dropping out before it was put on hold. 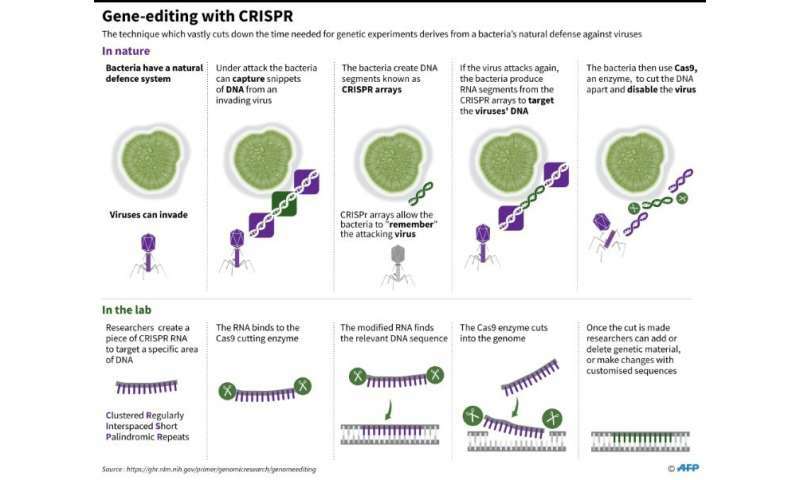 Fact file on the development of the CRISPr gene-editing technique. A Chinese scientist has claimed to have created the word's first genetically- edited babies. Experts warned that editing human embryos can create unintended mutations in other areas—so-called "off-target effects"—which can have an impact through the lifetime. Co-creator of the technology Jennifer Doudna said she felt "horrified" at hearing He's talk, adding she felt deeply concerned for the people affected and questioned whether they really understood the procedure. Summit organisers said germline genome editing could become "acceptable" in future if rigorous criteria are met, including "strict independent oversight".